Can amphibious architecture help Bangkok stay afloat when it floods? Architect Chutayaves Sinthuphan explains how his amphibious house in the village of Ban Sang, Ayutthaya Province, rises on pontoons during a flood. BANGKOK - Faced with the prospect of a future under water, Thailand's capital is searching for solutions to fight its fate. The world's first international conference on amphibious architecture, to be held here later this month, may offer some answers as more than 60 experts gather to debate a relatively new discipline for the aquatically challenged city, once known as the "Venice of the East." Bangkok has paved over most of the canals that won her that romantic accolade decades ago, but in 2011 the metropolis came close to reclaiming its water-logged reputation when massive floods inundated swathes of the capital and most of the central plains, causing an estimated 1.46 trillion baht ($41 billion) in damages and lost opportunities, according to the World Bank. Four years later, city planners have yet to devise a master policy for adjusting buildings and infrastructure to a future that seems inevitably soggier. One possible solution is amphibious architecture, which according to proponents, works with a flood rather than trying to obstruct it. The idea is to construct buildings in a way that allows them to float on the surface of rising floodwater. The building's amphibious foundations keep it connected to the ground while the rest floats as needed during floods. The conference is timely. A study commissioned by the government and presented to the cabinet last month warns that large parts of Bangkok could be under water 15 years from now if no action is taken. 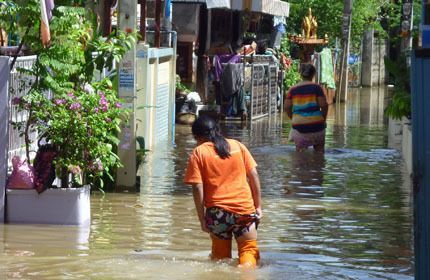 The study, compiled by the National Reform Council's committee to prevent subsidence in Bangkok, found that even without another major flood, the capital faces numerous water-related threats. 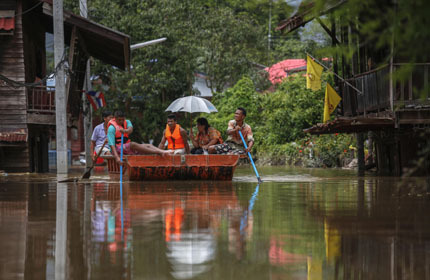 Residents sit on a loader and boat as it makes its way down a flooded street at Srimahaphot district in Prachin Buri province, east of Bangkok September 24, 2013. 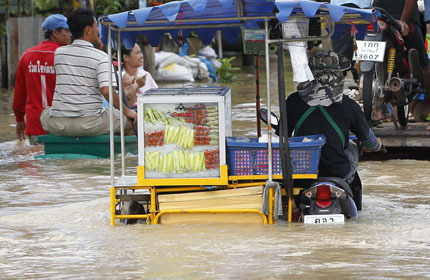 A fruit seller rides his motorcycle through a flooded street at the Srimahaphot district in Prachin Buri province, east of Bangkok September 24, 2013. 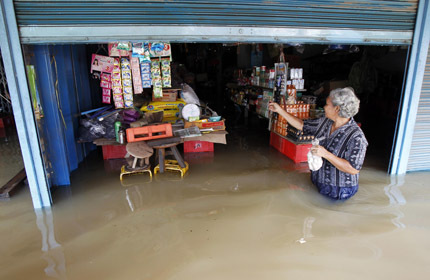 A resident walks outside a flooded shop at Srimahaphot district in Prachin Buri province, east of Bangkok September 24, 2013. 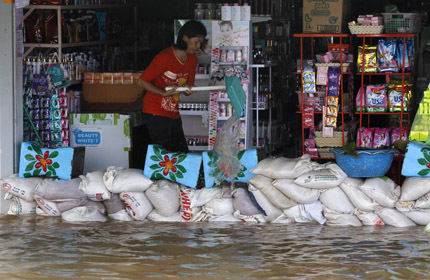 A woman empties water from inside her house to the flooded street outside at Srimahaphot district in Prachin Buri province, east of Bangkok September 24, 2013. 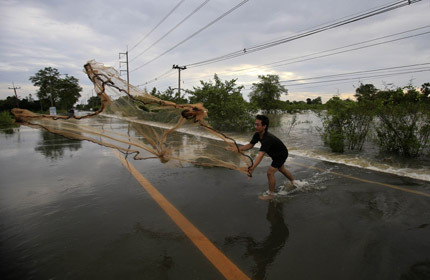 A man casts a fishing net on a flooded street at Srimahaphot district in Prachin Buri September 29, 2013. 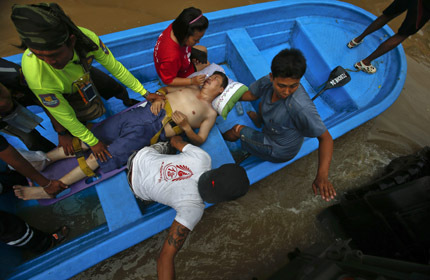 Rescue workers tend to a man, who suffered from epilepsy, on a boat along a flooded street at Kabin Buri district in Prachin Buri September 29, 2013. 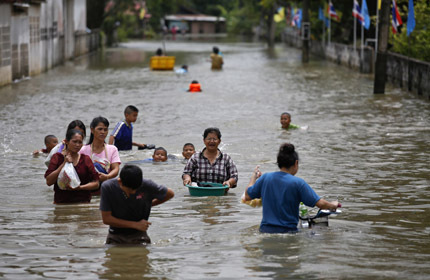 People wade through a flooded street at Kabin Buri district in Prachin Buri September 29, 2013. 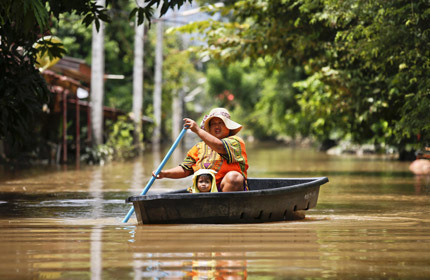 A woman and her child travel along a flooded street by boat at Kabin Buri district in Prachin Buri September 29, 2013. 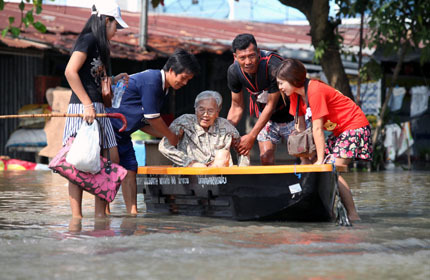 Soldiers carry a woman out from a truck along a flooded street at Kabin Buri district in Prachin Buri September 29, 2013. 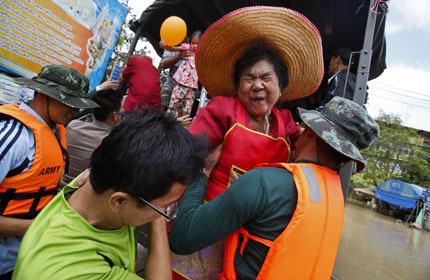 Residents affected by the flood receive a handout of water supplies from army soldiers at Kabin Buri district in Prachin Buri September 29, 2013. 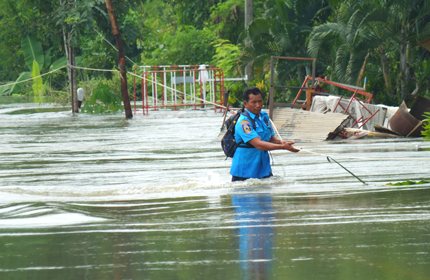 A rescue worker wades through waist-high water in Sa Kaew province while on a mission to help flood-affected residents. 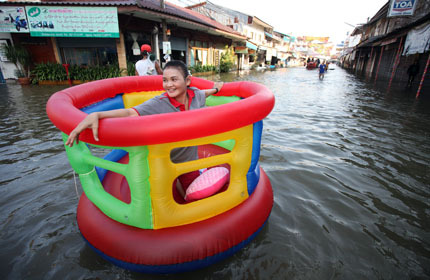 A woman enjoys floating in an inflatable playground item on top of floodwater in Aranyaprathet in Sa Kaew. 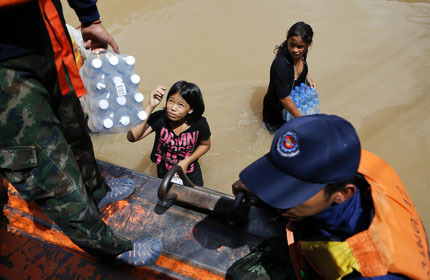 A girl plays in a flooded street at Srimahaphot district in Prachin Buri September 29, 2013. 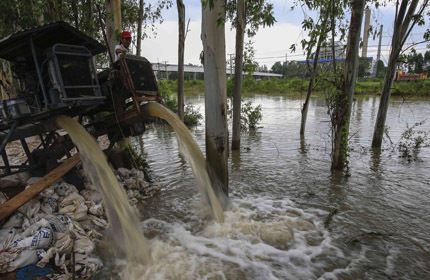 A man looks on as water is pumped out of a canal near 304 Industrial Estate at Srimahaphot district in Prachin Buri September 29, 2013. 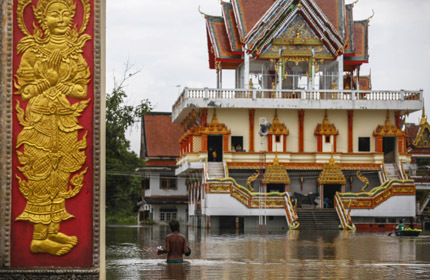 A man wades through floodwaters inside a temple at Kabin Buri district in Prachin Buri September 29, 2013. 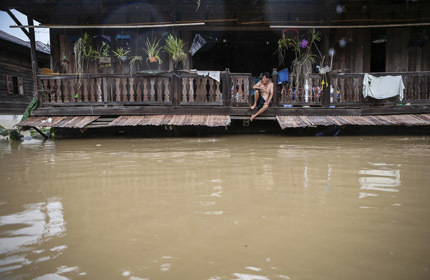 A man sits on the second floor of his house, affected by floodwaters, at Kabin Buri district in Prachin Buri September 29, 2013. 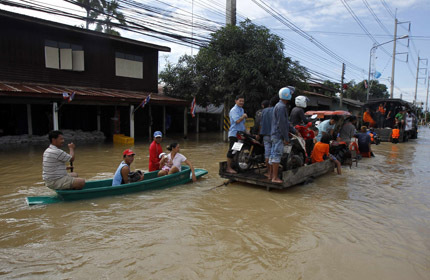 People paddle as they travel along a flooded street by boat at Kabin Buri district in Prachin Buri September 29, 2013. A housing estate in Nonthaburi located near the Chao Phraya River was under a metre of water this week. 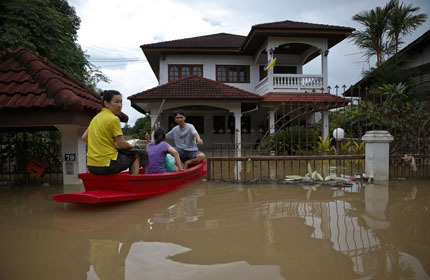 A man paddles his family out of the flooded compound of their house on a boat along a street at Kabin Buri district in Prachin Buri September 29, 2013. 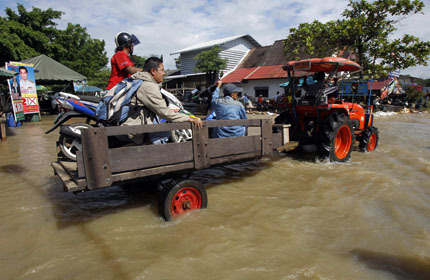 Residents sit on a loader as it makes its way down a flooded street at Srimahaphot district in Prachin Buri province, east of Bangkok September 24, 2013. 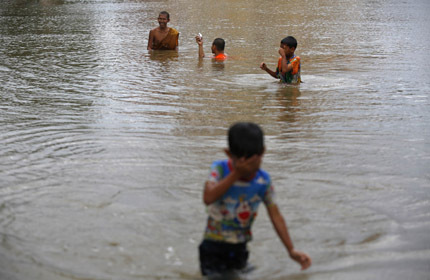 Buddhist monks and children wade through floodwaters near a temple at Kabin Buri district in Prachin Buri September 29, 2013. 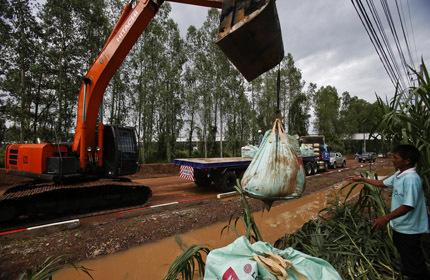 An excavator carries a sand bag to fortify a barrier as floods advance near 304 Industrial Estate at Srimahaphot district in Prachin Buri September 29, 2013. 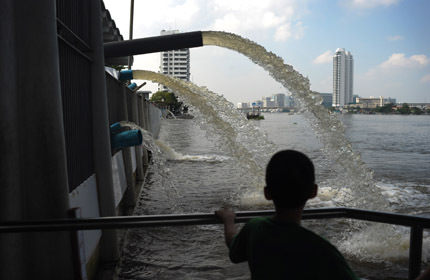 A child watching as pipes redirect floodwater into the Chao Phraya river from western Bangkok.